USB Killer, a device that can kill USB devices such as laptops, telephones, consoles, cars, networking equipment via a USB slot by using negative power surge flaw. From pen drives to hard drives, and from input devices to printers, you can hardly find any gadget nowadays, which do not come with the widely accepted, highly loved USB interface. USB or Universal/Uniform Source Bus is an interface, which allows different types of connections, through a common port. USB is a marvel in the world of technology, which has called it a day for a number of other parallel connectors, and individual connectors for various devices, making our lives a lot easier. I don’t think, the readers here, need any more introduction about the term USB, as, come on, everybody knows about it! But just like a coin has its tail, there is a certain USB device, which can damage your computer, or other devices, with a USB interface, beyond recovery. Yes, that is USB killer. It might be the 1st time you are hearing the term, but such a device exist in the world, which can kill or damage any device beyond recovery, once it is plugged on to your computer, a USB OTG enabled smartphone, or any other device, which comes with a USB interface. It is just a small piece of information, which you should know, if your personal computer is handled by a lot of people, or you are running a cyber cafe, where many people come regularly and plug in their USB devices without letting you know. The small pen drive sized USB killers come with a small circuit, where there is a capacitor present within it and it plays the most important role of damaging the devices. If you do not know anything about capacitors, they are tiny electronic components, which are found in all the electrical and electronic gadgets, which we use on a regular basis. Capacitors do the function of charging and discharging themselves repeatedly, which turns out to be helpful in several electronic activities from the power supply to storing data, and a lot other things. But How do USB Killer works! 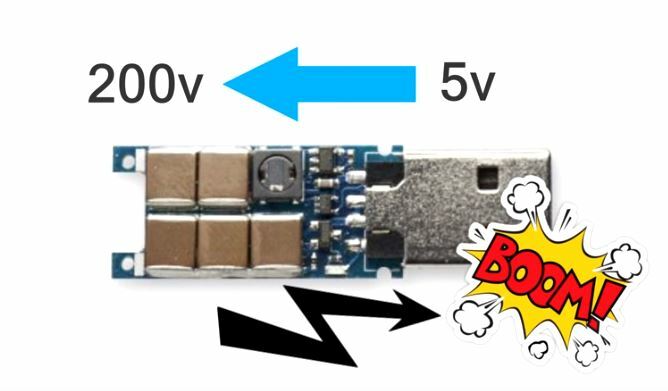 What happens in the USB killer is that, once you connect the USB killer device to your USB port, the capacitor present inside it starts charging very fast with the 5 Volts, power source, which is available from most USB interfaces used regularly. Once the charging is complete, there is a transistor, which discharges the complete charge at -200 Volts DC or VDC through the data lines, causing a massive power surge, which can be enough to roast your complete system beyond recovery. Depending upon the component, which has been damaged by the USB killer, it might or might not be repaired. If you are lucky enough, you might have to change the USB port just, and if karma is not happy with you, the USB killer can completely damage your motherboard or an important component on the motherboard, maybe the BIOS chip, which can hardly be replaced or repaired. If you are not having a Mac device, your device is, in most cases vulnerable to USB killer attacks, and thus, you should always check any new USB devices before it is connected to the computer. In most of the cases, the USB killer devices look similar to pen drives, which can be a matter to worry about. Though, if you have a look at the size, you can notice some differences. But if you are having a Mac device, you will not face any kind of troubles with USB killers, other than damaging your USB device, as they come with optocouplers, which can save the device from any negative voltage, placed through the data lines. I just came to know, there is a Hong Kong-based company, which is commercializing two devices, where the intention of one, is to kill the devices, while the other can provide some protection against the USB killers. I did not find any proper website to purchase such a device, and thus, I am not giving the link. There are a number of DIYs to save your computer from USB killer attacks, and you can have a look at them. I will not comment on the authenticity of such products, and can’t assure, they will work properly. If you have the hobby of making some small electronic circuits, trying them, out will not take a lot of time. If you guys want, I will try out a protection circuit and will share them with you in a new article, if I am successful in making that. All USB devices (except USB 3.0) come with 4 pins, and each of them is present for a purpose. The two pins at the extreme ends, act as power lines, to provide power to the USB device. As it is quite general, all electronic gadgets need power, that power is supplied through the power pins. Among the two other pins, one pin is meant for clock pulse synchronization, necessary for all digital gadgets. The other is the data pin, through which data passes between your USB device and the computer. The power pins are invariably connected to the main power supply of your computer, which might be the SMPS on your computer or some other device. But, the data lines are directly connected to the most important components of your motherboard, like the RAM, BIOS, and other sensitive components. Such small components are capable of handling just 3 to 5 volts, and -200 Volts is like a thunder attack for those components, and the consequence of the same is discussed all over the article. What is the purpose of a USB Killer? Most of the devices except Apple do not protect the power or data lines of devices which let anybody to attack and ruined such as devices. The USB killer is meant to test those components for protection from power surges but people might use it for different purposes too.. USB Killer is available to buy online around $80 on Amazon. Though USB killer might seem to be a destructive product, but it can also be helpful for a limited set of users out there. You might be working on a secret project, and in case there is a raid, or the data, which you are working on can be leaked, you can damage your computer completely with the help of a USB killer, though there is no guarantee that the data on your hard drive will be completely erased. Though, it can also damage the hard drive, but the data can still be recovered from the spindle shaped disks, which means, using USB killers to damage data is not a judicious idea though. It can also be helpful, if you are fed up with your old PC, and you are not getting a reason to switch to a new one. Just kidding! If you’re expecting, I will be giving you the circuit diagram or the ways to make a DIY USB killer, I’m sorry I cannot do that. My only intention of writing this article is to inform my readers that there is a device named USB killer, which can completely damage your devices, and thus, you should be careful from it. Hope this small information helped you, and if you have a great way of keeping your device safe from USB killers, do let us know in the comment section below.